In case you’re not satisfied by the Android experience offered by your Honor 8 Pro smartphone you can try replacing the default software with a custom ROM. The custom ROM presented in this post is the new Paranoid Android platform. This new Paranoid Android system has the build number 7.2 and is based on the Android 7.1 Nougat OS that gives a pure-like Android experience in term of pre-installed apps and processes. Moreover, the custom ROM will ensure a smooth and stable experience and also various customization options. Follow and apply the guide from below if you want to install the Paranoid Android 7.2 Nougat Custom ROM on your Honor 8 Pro smartphone. Though the Paranoid Android system for the Honor 8 Pro device is still in development phase, meaning that minor problems might still be encountered. But, you can successfully use the Android Nougat based ROM on a daily base. Apply the steps of the tutorial only if your device is the Honor 8 Pro. Make a Nandroid backup of your device to use in case you don’t like how the new OS is running. 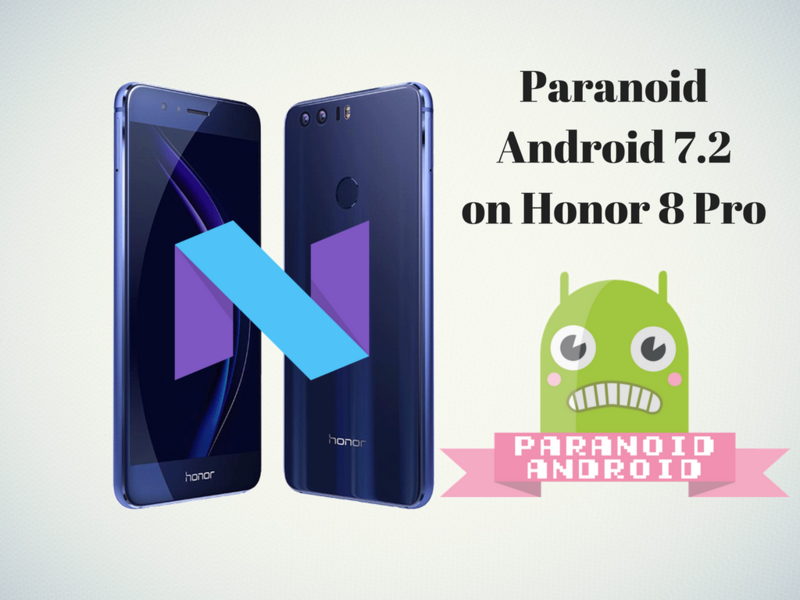 If you save the currently Android firmware that is running on your Honor 8 Pro smartphone and if after finishing the installation of Paranoid Android custom ROM and after testing it; you will want to go back to the stock firmware, you will be able to do it by using the Nandroid backup file. The Paranoid Android ROM is not developed by Huawei or by Google, but by third party devs, so by applying an unofficial operation, you will lose the warranty of your phone. The installation of the Nougat based Paranoid Android 7.2 custom ROM can be successfully completed only if you previously had flashed the TWRP recovery or any other custom recovery software and if your Honor 8 Pro smartphone is rooted. Enable the USB Debugging option on your smartphone from the Developer options menu. The Developer options can be unhidden from Settings->About Phone and by tapping repeatedly on the Built Number until the ‘you are a developer’ message appears. Charge the smartphone before starting the Paranoid Android 7.2 update procedure and make sure that the battery power is more than 50%. On your computer, download from here the Paranoid Android firmware. On your computer, download from here the Google Apps, because the Paranoid Android packages do not include them and these must be flashed separately. Power off your Honor 8 Pro and enter it into the recovery mode by pressing and holding the Volume Down and Power Key at the same time. From recovery menu select ‘wipe data factory reset’, ‘wipe cache partition and ‘wipe Dalvik cache’. Go back to the main menu of recovery and choose ‘reboot system now’. Transfer the update package from the computer on the smartphone and then, remove the USB connection. Power off the smartphone and go into Recovery mode one more time. Tap on Install and select the Paranoid Android update package, then swipe to start the installation process. Repeat the last step to install the Google Apps suite. From the main menu of Recovery select ‘Reboot system now’. The latest built of Paranoid Android OS is now installed on your Honor 8 Pro and now you can test how it runs.